Red #27 – Error or Melted? The first auction, HUGE Lot 75 M.U.S.C.L.E. Muscle Men Kinnikuman Figures Colored Blue Red Green, is a bit of a mystery – if you care about such things. For most M.U.S.C.L.E. collectors the lot is simply a lot of 75 mixed figures with a starting bid of $19.99. For the slightly more insane M.U.S.C.L.E. collectors it is an opportunity to potentially own a Manufacturing Error Figure or a lot of 74 figures and one tortured, melted, and disfigured Red #27. It is always exceedingly difficult to identify and confirm an error figure. The greatest probability is that the figure is simply a damaged figure. However, one thing does give hope to the error figure hounds. Many of the Manufacturing Error Figures have rather amazing coincidences between Parts and Errors. The Red #27 comes from Part One, which also included #35, #60, #61, and #123 which also have errors. Tortured? Error? Probably only the new owner will know – but hopefully they will share their finding. The second auction, RARE Vintage Mattel M.U.S.C.L.E. 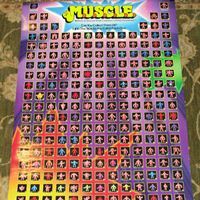 Muscle Kinnikuman 1985 Mail Away Poster 35×23, is a colored poster with a starting bid price of $349.99. The poster is certainly in very good condition, but the price is simply outrageous. Posters in the very best of condition range between $50 and $100. For $349.99 this would have to be the original poster that Mattel created as the template for all the other printings. Even compared to the absurdly priced framed poster cost $100 less. 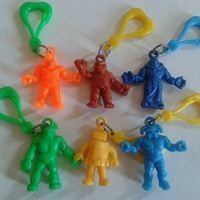 The third auction, Vintage kinnikuman musclemen figure key ring chain fob figures x 6, was also featured in last week’s Epilogue. 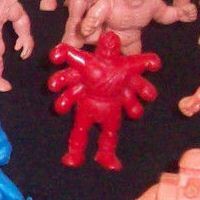 If collectors don’t know, these figures (or “Tweaks“) are about half the size of normal M.U.S.C.L.E. figures. These key chain figures are interesting, but rather unpopular. Even among the tiny niche counterfeit fans these figures are not very popular which is what makes the Buy-It-Now option of roughly $22 a difficult selling point. 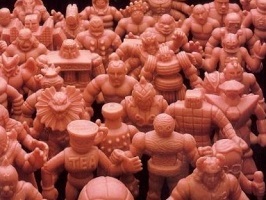 Most collectors have simply accumulated them through purchases of larger M.U.S.C.L.E. lots. There may be a literal handful of collectors that would be willing to buy these figures on their own. Roughly $3.70 per figure sounds like a steal for almost any figure. But normally these are sold as inconsequential pieces of an auction – no value is attributed to them in an auction price. For this auction to sell, the seller would likely have to switch to an auction format and probably start at $3.70. This entry was posted on Wednesday, July 30th, 2014 and is filed under Auction Watch, UofM News. You can follow any responses to this entry through RSS 2.0. You can skip to the end and leave a response. Pinging is currently not allowed. Oh dear! Please blame me, the wife, listing her husband’s stuff from storage. I relisted his poster as an auction. He doesn’t really like letting go of his collectibles, but a couple other people let me know about the poster. My husband would like a true collector to have the poster at a fair price.